Death. It’s that very real part of homesteading that no one really likes to talk about much. Dealing with animal death on the homestead is a touchy subject, but it’s one that really can’t be ignored. If you have animals on your homestead, you will, at some point, deal with death—generally, for one of four reasons. Whether you choose to butcher at home or send your animals away to be processed, death comes to us all, little chicken. There is no way to get around dealing with animal death on the farm if your purpose in raising a certain animal is that they will eventually end up in your freezer. No matter what anyone says, we bond with our farm animals. The longer they are around, the stronger that bond. It’s hard to walk into the barn and discover your favorite goat or horse or cow has suddenly died. Animals can live a long and happy life at your homestead—and hopefully, they do!— but nothing lives forever. Animals get sick. Animals get hurt. Animals have issues that can’t be remedied (or cause us to consider financial ramifications for keeping them alive). It’s hard to make the decision regarding the life of your animal who has been sick for an extended period of time and isn’t showing improvement. It’s a tough call to know what to do when your animal can’t walk or get up or move at all. 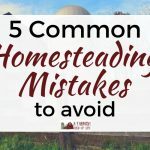 Being a homesteader means tough life and death decisions—in the most literal sense of the phrase. 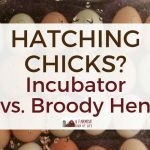 When predators visit your homestead, there isn’t always a happy ending for the animal they’re after, or the predator themselves. At our farm we’ve lost animals to fox, eagles, dogs, hawks, raccoons, owls, as well as many predators I haven’t actually seen in action. Again, it’s part of homesteading with animals. And sometimes, despite your best predator proofing tricks, they’ll still find their way in. Death is a way of life on the homestead. Simply put, death comes with the territory of homesteading. It’s difficult to write a blog post about it, however, because in trying to say something like “it gets easier” or “you’ll get more comfortable with it”, it’s almost always scooped up and taken the wrong way. People want to argue semantics—usually people who aren’t homesteaders, because those of us who do deal with death on the homestead know our feelings surrounding it are hard to describe. When reading an article, we tend to “understand what the author meant” regardless of the way they’ve probably fumbled through it. But I think it does get easier in a sense…even though that still doesn’t sound like the right word. The first time I had to euthanize a sick chicken, I cried. A lot. The most recent time I did it, I didn’t cry at all. Does that mean I’ve lost respect for the animals I raise? I don’t think so. I deeply appreciate and care for the animals we raise here. I just think death is part of the package, and it’s become an odd sort of farm normal for me. Is our discomfort with death on the homestead because we’re more removed? I often try to imagine what it was like in 1850 out on the prairie. I wonder if people sat outside the lean to contemplating how someone could take the life of a chicken in order to eat supper, and whether or not it made them sad. I mean, I don’t intend to come off as super tough and callous, because I’m not. It’s tough to be the one to deliver killing shots to 3 pigs you’ve raised. Butcher day isn’t really my favorite day on the calendar. There is always a sort of serious solemnity to it. But I do think the fact that we can devote so much brain space and social media chatter to whether or not someone is sad when they have to butcher their chickens or put down a lame cow or process their pig means we’re far more separated from our food system than our ancestors were. Homesteading with animals is a wonderful experience. I wouldn’t change it for anything! But deciding to bring animals to your homestead means you’re signing up to deal with their death at some point in your journey. 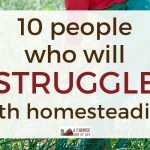 Homesteading isn’t for the faint of heart, and dealing with death is one of the times it’s toughest. I know exactly what you mean, it’s always hard when an animal dies regardless of the reason. I don’t think it gets easier, but for me it just gets easier to accept. There’s always a sadness that envelopes me when I lose an animal, but I realize, like you said, iI realize t’s just part of the homesteading package. Thanks for sharing your heartfelt words. Boy, talk about perfect timing. I just had to put one of my goats down Monday, due to him getting very, very sick. It wasn’t an easy decision, but, we knew that was the kindest thing to do to ease his suffering.. It’s Never easy, but, it’s just a part if this life. 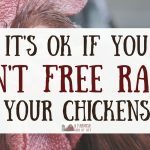 I remember the first time a dog ripped through my yard and killed every single chicken. I cried and cried and cried. I was crying so hard I eventually got a migraine. I agree with Taylor, it eventually gets easier to accept. It’s never easy, but you learn to accept predators are out there and they need to eat too. We just put a second alpaca down last night. The first was lost about a year ago to a menangeal worm I didn’t even know existed until she was so far gone there was nothing we could do. Last night we lost a mother after labor to a prolapsed uterus and so much blood loss. We have her cria here, slightly premature and not doing well – although, if my kids have anything to say about it with their constant care, she IS going to make it. My heart gets so worn out sometimes. I was comforting my current five year old last night and remembering comforting her big sister when she was about that age and we lost our first chickens. We decided then that it was better to know these animals, live with and love them, than to not ever love them at all. I realized last night as my five year old sobbed that I still do believe that. I analyze our husbandry practices and, although they aren’t perfect, they’re adequate and loving and complete. Still, I feel like God has been sending us animals to die lately – in this safe, loving place. I’m rambling. Very good article and good to read today – thanks!